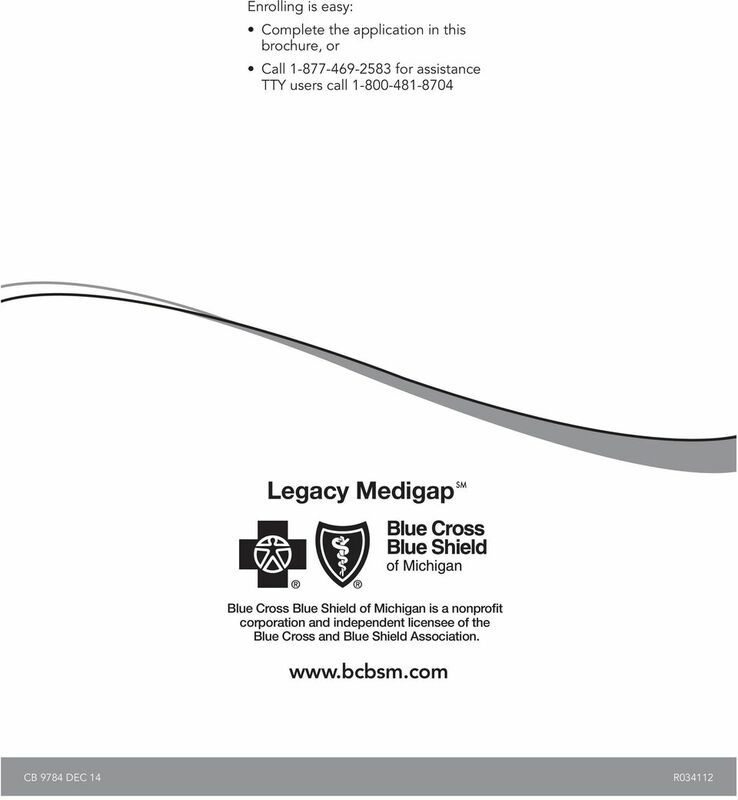 Download "Legacy Medigap SM. 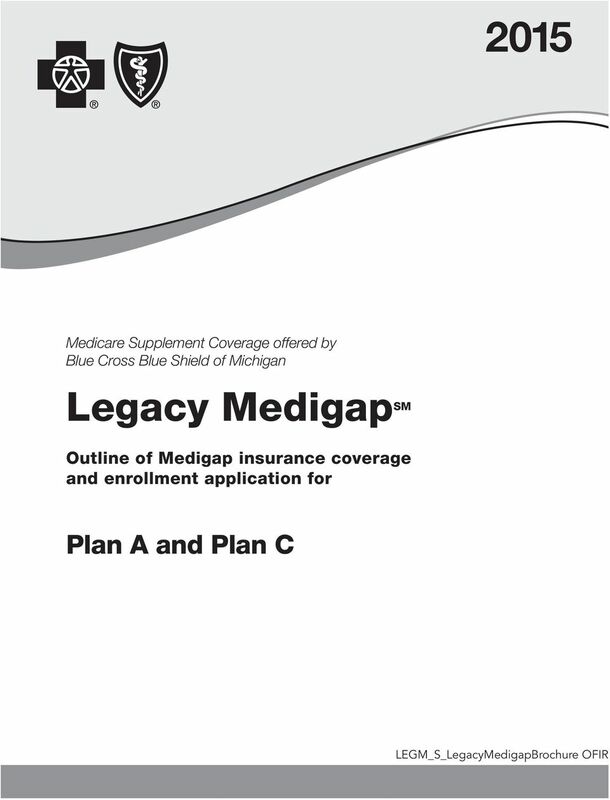 Plan A and Plan C. Outline of Medigap insurance coverage and enrollment application for"
15 NOTICE TO APPLICANT REGARDING REPLACING MEDIGAP INSURANCE OR MEDICARE ADVANTAGE SAVE THIS NOTICE! 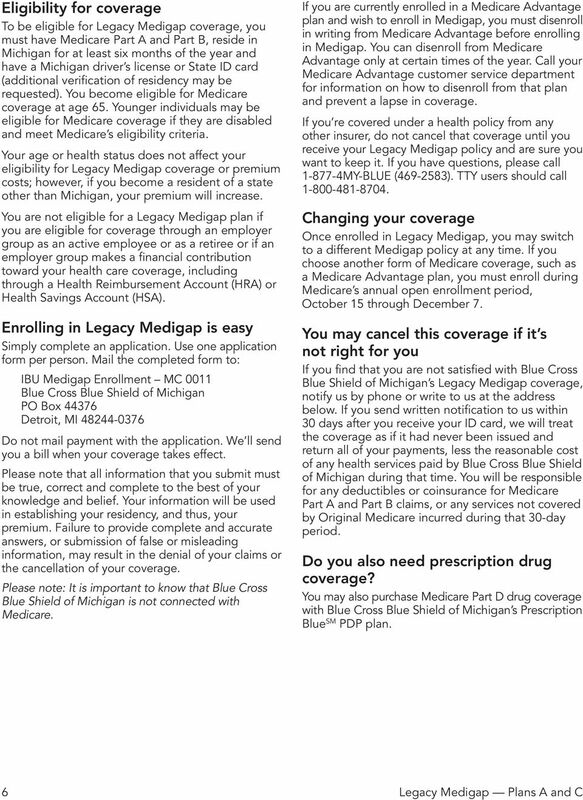 IT MAY BE IMPORTANT TO YOU IN THE FUTURE IBU Medigap Enrollment MC 0011 Blue Cross Blue Shield of Michigan PO Box Detroit, MI According to your application, you intend to drop or otherwise terminate existing Medigap coverage or Medicare Advantage plan and replace it with a policy or certificate to be issued by Blue Cross Blue Shield of Michigan. 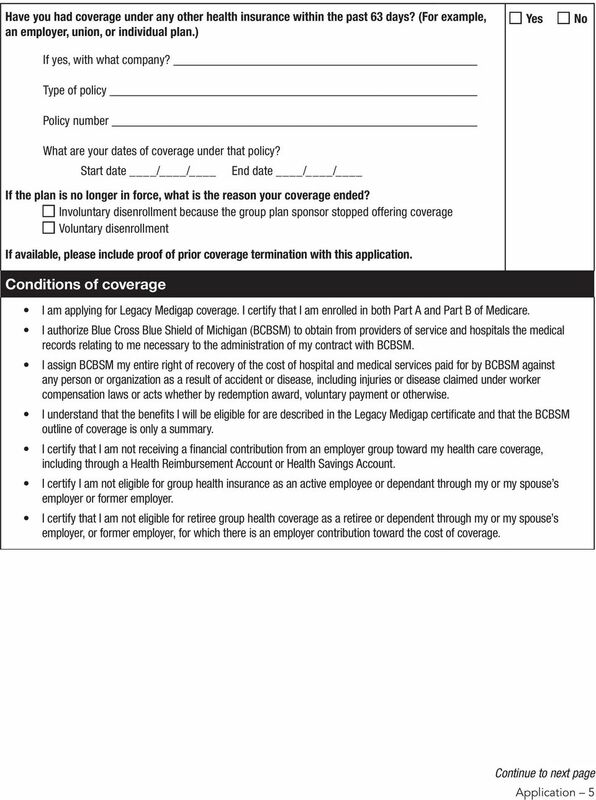 Your new policy or certificate provides 30 days within which you may decide without cost whether you desire to keep the policy or certificate. 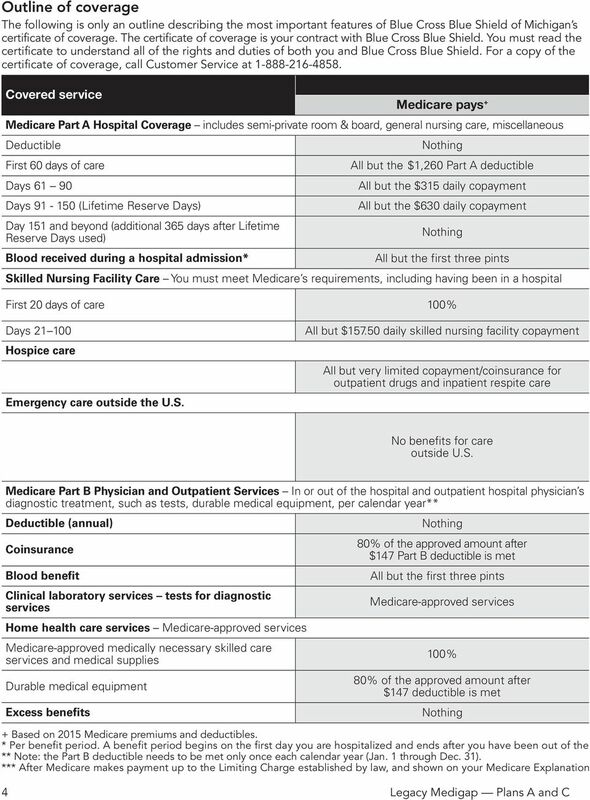 Your insurer will waive any time periods applicable to pre-existing conditions, waiting periods, elimination periods, or probationary periods in the new policy or certificate for similar benefits to the extent such time was spent or depleted under the original coverage. If, after thinking about it carefully, you still wish to drop your present coverage and replace it with new coverage, be certain to truthfully and completely answer all questions on the application concerning your medical and health history. Failure to include all material medical information on an application may provide a basis for the insurer to deny any future claims and to refund your premium as though your policy or certificate had never been in force. After the application has been completed, and before you sign it, review it carefully to be certain that all information has been properly recorded. 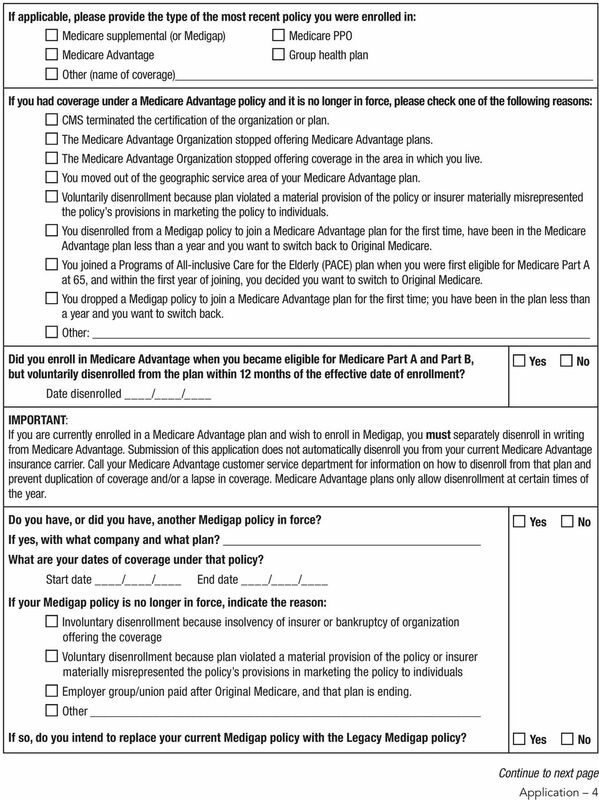 You should review this new coverage carefully, comparing it with all disability and other health coverage you now have and terminate your present coverage only if, after due consideration, you find that purchase of this Medigap coverage is a wise decision. Do not cancel your present policy until you have received your new policy and are sure that you want to keep it. 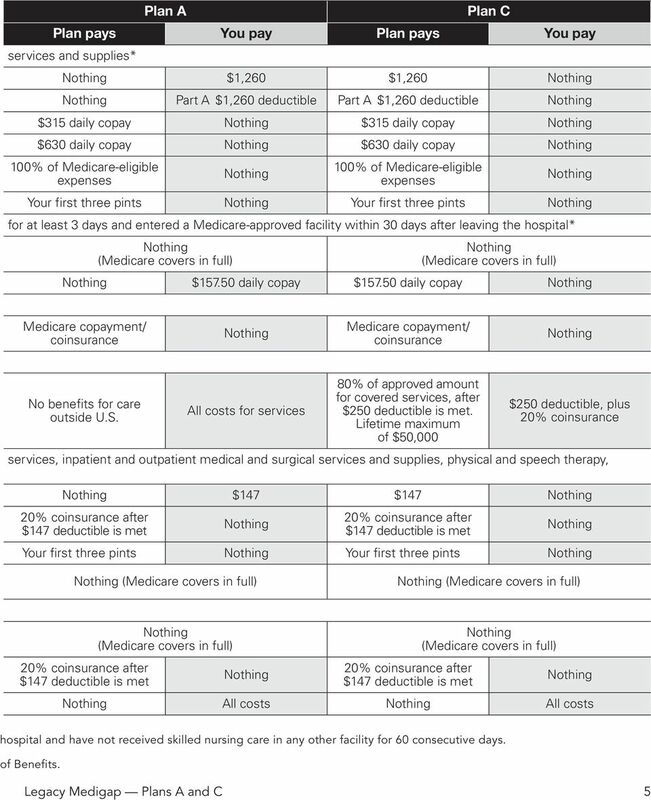 The replacement policy is being purchased for the following reason(s) (check one): Additional benefits No change in benefits, but lower premiums My plan has outpatient prescription drug coverage and I am enrolling in Part D Disenrollment from a Medicare Advantage plan. 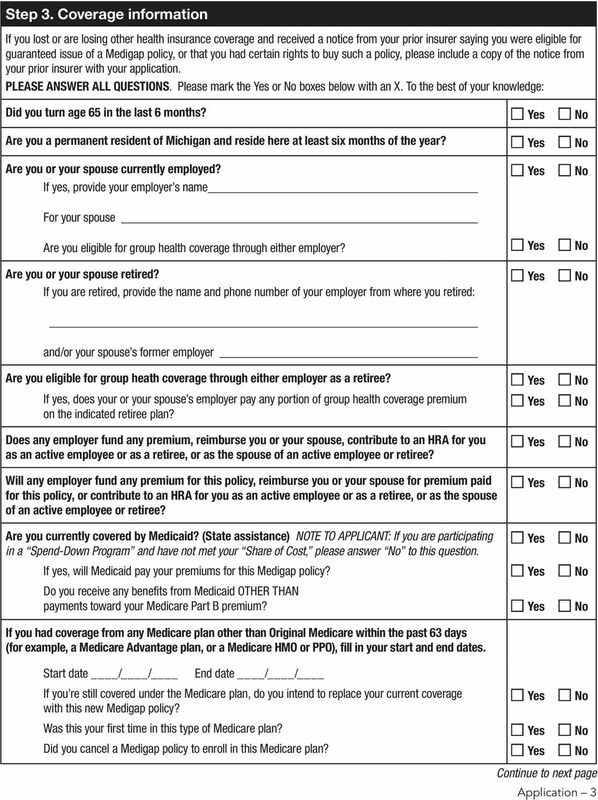 Please explain reason for disenrollment: Fewer benefits and lower premiums Other (Please specify) Applicant s signature Date Applicant s printed name Applicant s address Return this form with your application materials. Be sure to save a copy for your records. 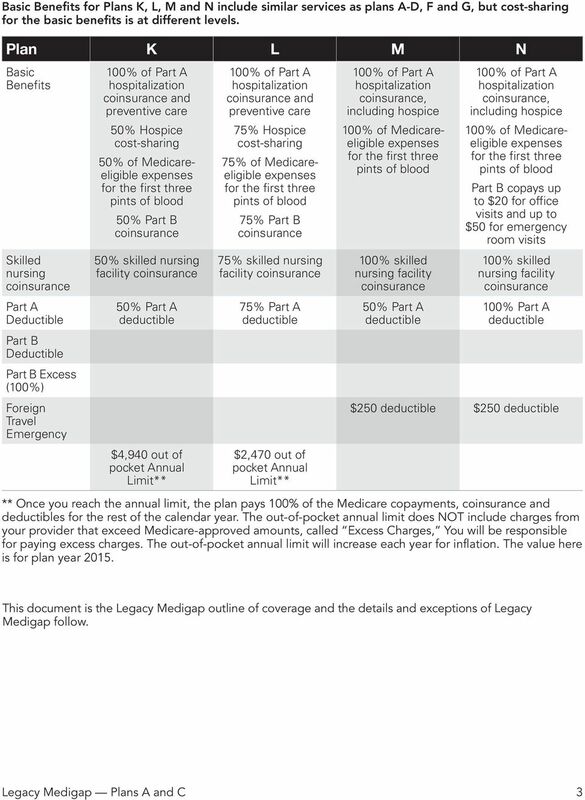 Please note: If you were enrolled in a Medicare Advantage plan and intend to replace it with Legacy Medigap, you must complete and sign this form. 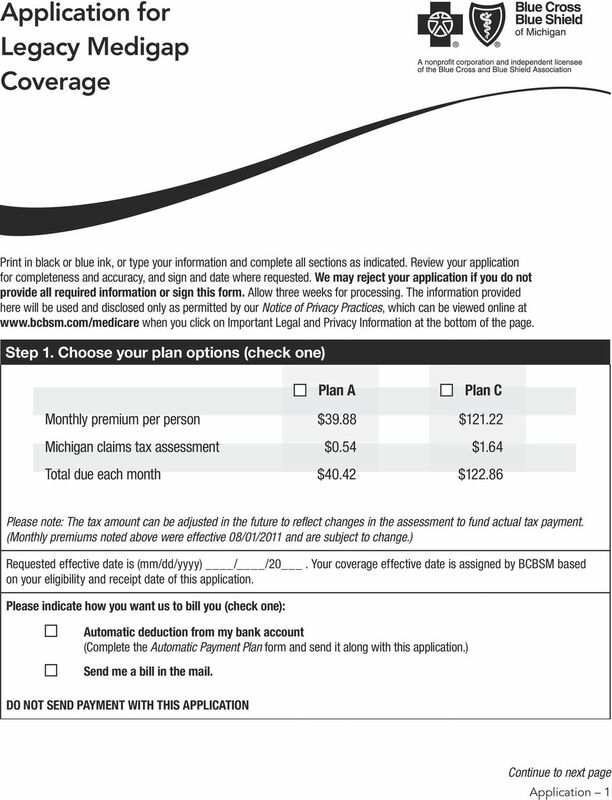 17 Automatic Payment Plan for Individual and Direct Billed Customers BCBSM Automatic Payment Plan offers the convenience of paying your health care bill on time, every time. No need to write checks, mail payments or worry about late payments resulting in rejected services. To participate, simply fill out and mail in this enrollment form. Please include a blank, voided check or a deposit slip from your designated account for verification. Please allow three to four weeks for processing your application. Continue to mail your payment as usual until you see Automatic Payment on your bill. You may receive a paper bill for your first payment. This payment must be made or they will be added to your second [auto] bill. Please note: If you decide at anytime that you no longer want Legacy coverage, you must notify us of termination or we will continue to deduct payments from your bank account. 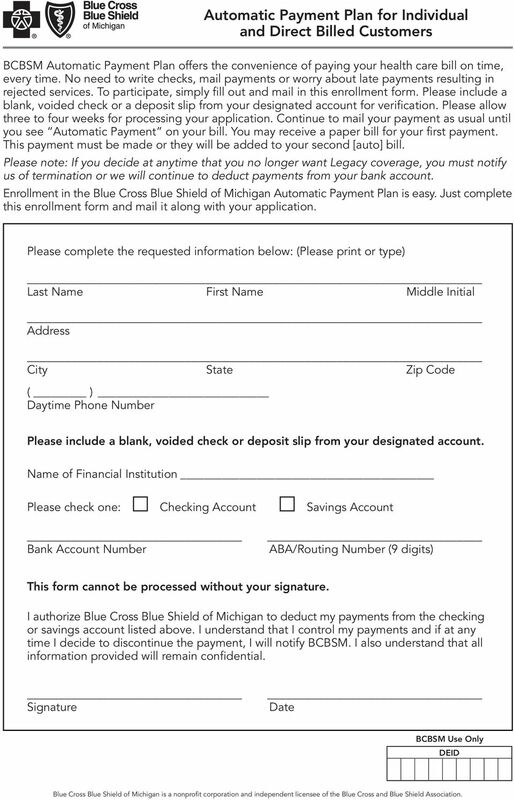 Enrollment in the Blue Cross Blue Shield of Michigan Automatic Payment Plan is easy. Just complete this enrollment form and mail it along with your application. Please complete the requested information below: (Please print or type) Last Name First Name Middle Initial Address City State Zip Code ( ) Daytime Phone Number Please include a blank, voided check or deposit slip from your designated account. Name of Financial Institution Please check one: Checking Account Savings Account Bank Account Number ABA/Routing Number (9 digits) This form cannot be processed without your signature. 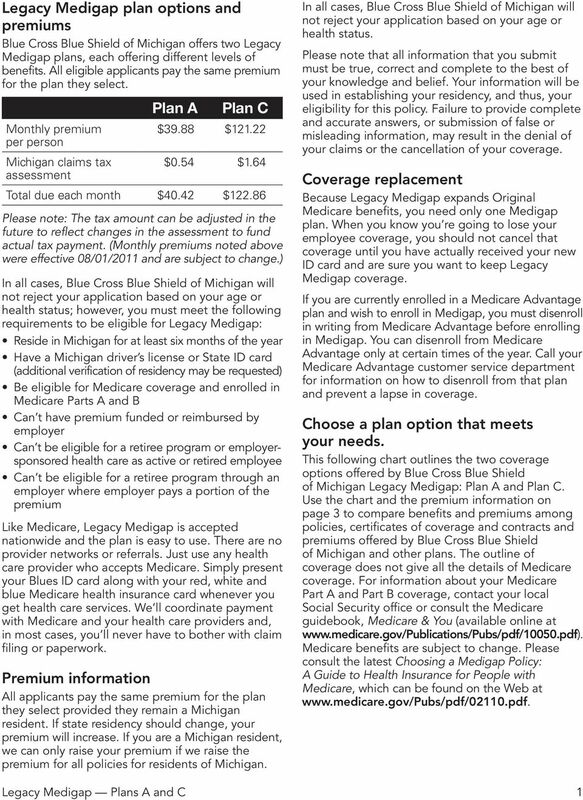 I authorize Blue Cross Blue Shield of Michigan to deduct my payments from the checking or savings account listed above. 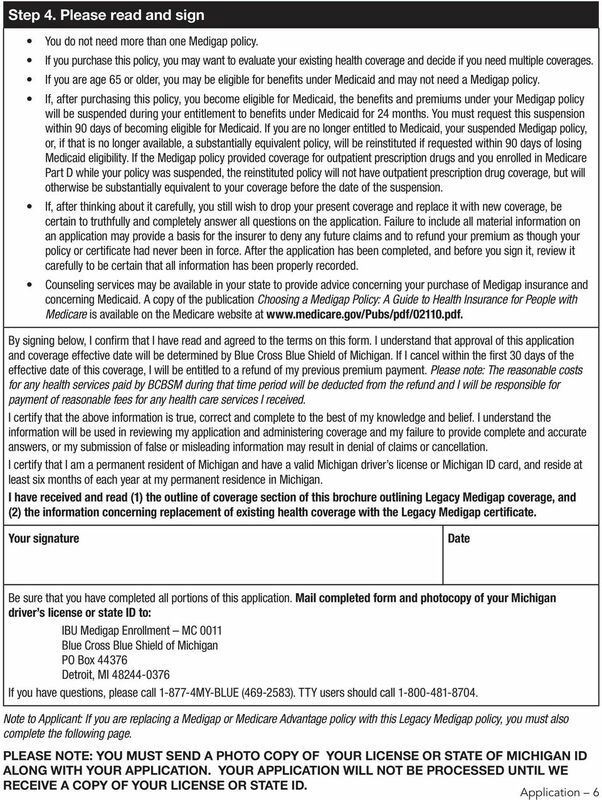 I understand that I control my payments and if at any time I decide to discontinue the payment, I will notify BCBSM. I also understand that all information provided will remain confidential. 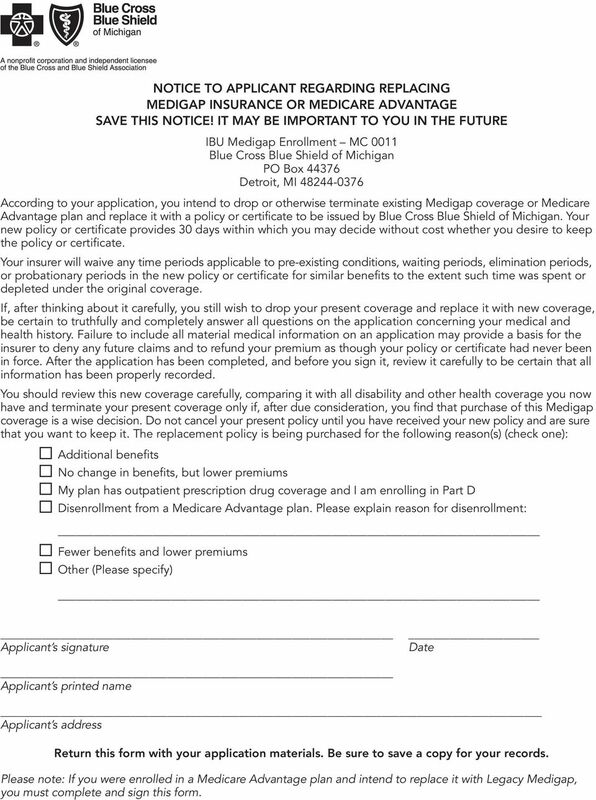 Signature Date BCBSM Use Only DEID Blue Cross Blue Shield of Michigan is a nonprofit corporation and independent licensee of the Blue Cross and Blue Shield Association. 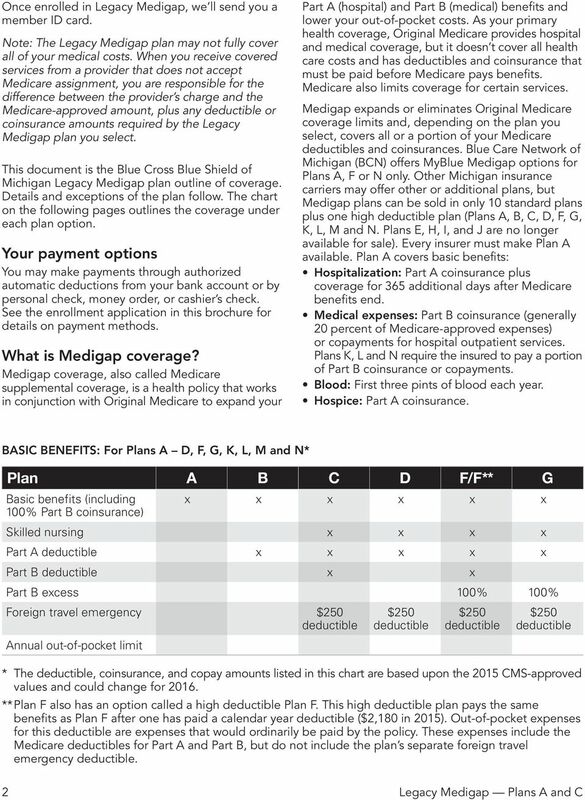 health plan My life, MyBlue MedigapSM Outline of Medigap coverage and application form Plans A, F, HD F and N www.bcbsm. 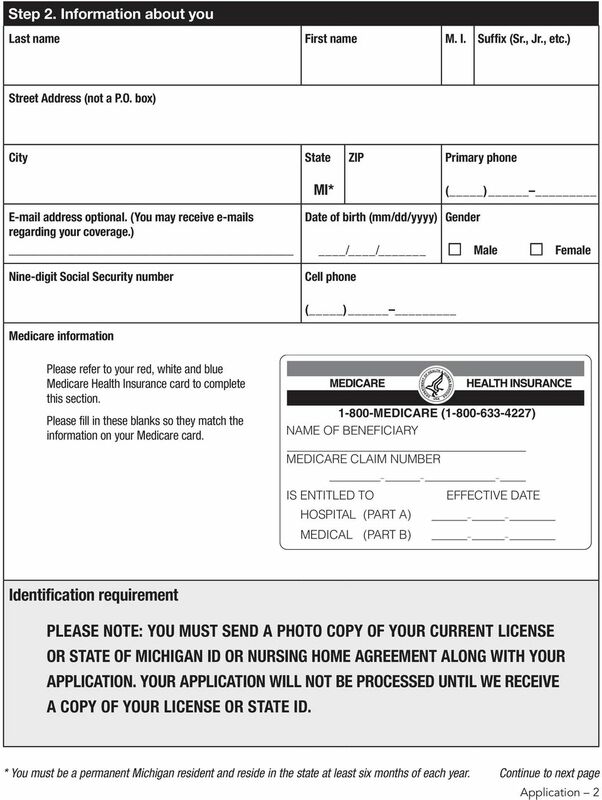 Thank you for your interest in the KPS Health Plans Medicare Supplement plan!